This post contains spoilers for Ant-Man and the Wasp. Marvel's been on a roll in 2018: Black Panther introduced T'Challa's home of Wakanda in full, only to have it come under attack in Avengers: Infinity War where (spoilers for a film that's technically still in theaters) half of the most profitable Avengers were snapped out of existence until 2019's Avengers 4. That left a big question mark on Ant-Man and The Wasp, with fans wondering how the movie would deal with Thanos' assault on Earth, if at all. It turned out the answer was "not very much," aside from the two (yes, two) post credit scenes that place Ant-Man and Co.'s arc in the crosshairs of Infinity War's scope, not without some confusion. Let's clear some of that up. When does Ant-Man and the Wasp take place in the MCU timeline? Ant-Man and the Wasp happens over three days sometime between Captain America: Civil War and Avengers: Infinity War. Scott Lang (Paul Rudd) is on his final days of house arrest for violating the Sokovia Accords in Civil War, and his ankle bracelet is officially removed at the end of the movie. But nowhere during the many heists does anyone bring up that anything shady is happening in New York or Wakanda. Ant-Man and the Wasp is even set in San Francisco, just across the bridge from where T'Challa and Suri shared a scene at the end of Black Panther, but there's no crossover here. 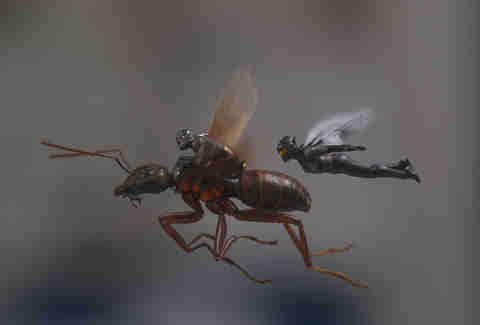 Where Ant-Man and the Wasp ties most into the MCU timeline is in both its post credits scenes. The mid-credits scene, taking place after a sequence of miniaturized versions of the film's many set-pieces, opens with Hank Pym (Michael Douglas) complaining about how he used to be a bigger deal on the science side of the MCU. It's revealed that Hank, a recently-restored Janet Van Dyne (Michelle Pfeiffer), and their daughter Hope have miniaturized the Quantum Tunnel they originally built in Hank's lab so it fits in the back of a van. 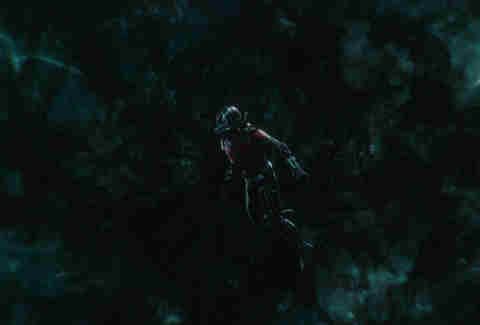 The three Pyms work machinery as Scott, in his Ant-Man suit, jumps into the Quantum Realm through the Quantum Tunnel with a canister meant to collect the Quantum Energy that Janet had used to heal Ghost's quantum instability. You'll remember from the film's climax that Janet had been absorbing that energy as she spent years surviving in the Quantum Realm, which has given her magical-healing-light powers. Sonny Burch (Walton Goggins) mentions that Quantum Energy is the next big thing in the MCU's technology arms race between humans and salvaged alien tech from The Avengers. Scott mentions that he's collecting all that Quantum Energy for their new friend Ghost, implying that she needs more of it to keep her stable even after a Janet E.T.-ouch-Elliot-touch to the temples. 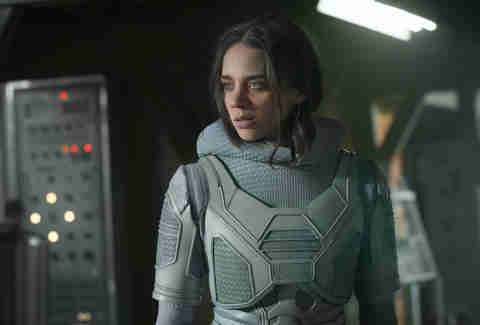 It also means that the Pym family and Scott are working with Ghost, who we last saw with Laurence Fishburne's Bill Foster. Considering their whole storyline was about him not abandoning her, we can assume those two are still in the mix… or have joined the Pyms on the run. There is no legal resolution for anyone except Scott, which means the Pym family is likely still hiding from the Feds, which explains why this experiment/Quantum Trip takes place in the open air out of the back of a van instead of a shrinkable lab. Though the legal status of the Pyms is on the precipice of change as Scott is in the Quantum Realm, listening to Hope's countdown before they pull him out and… she never gets to 1! When we cut out of the Quantum Realm, we see the last remnants of the ash that was Hank, Janet, and Hope blow away, snapped out of existence by Thanos in Wakanda like Bucky, T'Challa, and Peter Parker before them. Scott is apparently left trapped with a capsule of Quantum Energy in the Quantum Realm with no one left to turn on the Tunnel and get him out of there. How will Ant-Man get out of the Quantum Tunnel? Based on two things that we know about him and the Quantum Realm from the Ant-Man movies, don't worry too much about Scott: 1) The Quantum Realm operates far enough outside normal space time to make seemingly impossible things possible by adding the word "quantum" to it (which Ant-Man and the Wasp actually references as a joke in the film), and 2) Scott Lang is the only character we've seen escape the Quantum Realm using his own power before (see Ant-Man, the first). Even though he's in a new suit with an unpredictable regulator, it seems like giving it some pure Quantum Energy would probably get him back to the real world. 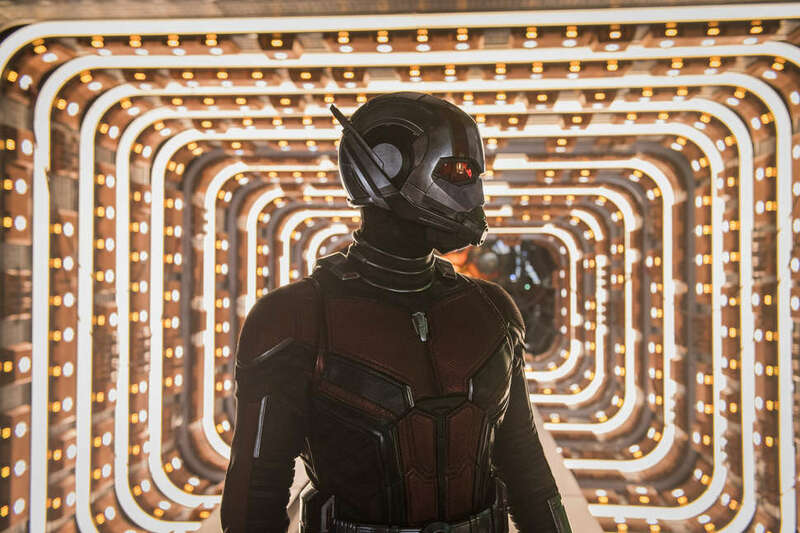 Just what Ant-Man's place is come Avengers 4 is just as big a mystery as it was at the end of Avengers: Infinity War, and Scott Lang wasn't even in that one. Much like Hawkeye, Ant-Man is an MCU wild card we haven't seen placed on the Infinity War game board yet. Unlike Hawkeye, Ant-Man is not an original Avenger that survived the snap of the Infinity Gauntlet. Set photos have shown Paul Rudd in his Ant-Man suit alongside Robert Downey, Jr., Mark Ruffalo, and beardless Chris Evans in his original Avengers Captain America suit, though we have no context as to how those characters come to be together in what looks like a re-creation of the Battle of New York. At the end of the film, we get an "Ant-Man and the Wasp will return" title card, just in case anyone was worried that Evangeline Lilly finally got to out-shrink Paul Rudd in the franchise before being snapped out of existence ("fridged," if you will). That appears not to be the case: Lilly has confirmed she has shot at least a little material for the still-untitled Avengers 4. One can only hope (pun intended) Michelle Pfeiffer and Michael Douglas get some un-ashed time in the 2019 sequel as well. What does the second post credits scene mean? Finally, there is the post credits scene, after what seems like an endless list of super-talented computer effects artists that managed to make the preceding film look so nice. We're back in Scott's house in San Francisco and pan over a television that's on the Emergency Broadcast System, so we know we're in a world after the Thanos snap where infrastructure is in chaos (see Infinity War's post credits scene, helicopter crash and all). We move through the house, hearing some rhythmic clicks, until we settle on the giant-sized ant from earlier in the film, still stuck in Scott's routine, playing the electronic drums. This shot was in the trailers for Ant-Man and the Wasp, and by the time the very end-of-credits comes along, you've probably forgotten that you saw the giant ant doing a lot of things in the movie, but not playing the drums. That was saved for the end… puzzlingly. Why show the ant here? 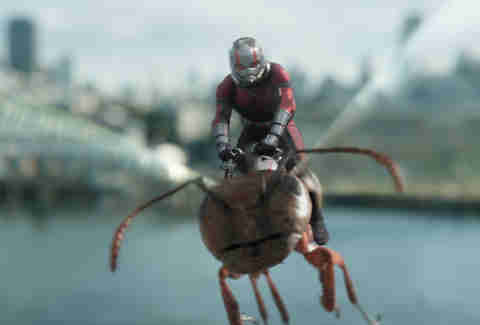 Assuming they didn't leave the poor thing in a hellish loop of a man's life for no reason, we can infer that the ant is there to play the same roll he did in the main movie's plot: to act as a placeholder while Scott is out Ant-Manning. This would mean only the Pym family, Ghost, and Bill Foster are on the run, and Scott actually does manage to fool the feds that he's abiding by the terms of his parole. Is he doing that by letting that giant ant live his life in his house while he's out? Or is that scene even further into the future, letting on that Scott is out helping the Avengers already, forgetting that he left his ant-double on his loop? That's some Westworld-level complexity for a post-credits scene. Or it could just be a funny shot of an ant playing the drums. Not everything is Nick Fury pulling out a modified pager from the 1990s. Dave Gonzales is an entertainment writer and podcaster. Find him on Twitter @Da7e.